What Exactly IS Das Fort? Even Steve Jobs had to explain Apple, at some early point in development. Das Fort, officially, is Fort Wayne's first small business blog, and yet it is so much more. It is a platform for the people of Fort Wayne, those who call das Fort home. "Das" has many meanings, depending on which language or acronym you're referencing, from days at sea, a varmint, surname, or even a crater on the moon. The source of Das Fort's beginning lies deep in ancestral roots. Spawned from the original brainchild of Lifestyle Photographer Tony Frantz (Spaces Quarterly), Das Fort began as an offshoot with a more specific aim: everything Fort Wayne. The online modern living guide, Spaces Quarterly was garnering international attention and writers from all over the world. Intended to focus on global spaces, one key element remained; based in Fort Wayne, many of the initial people involved were also from the area. Once local advertisers began to approach Frantz about Spaces, he realized the need to create a website solely for local businesses. Frantz, a German name itself meaning "free man," decided to play on the already existing basics. Beginning in the early 1800s Indiana had several waves of German immigration, one of the heaviest between 1836-1840. Adverse political and economic conditions in the Germanic states spurred this exodus, as well as the effects of the Napoleonic Wars. Those who settled here sought freedom, to live their lives and even to start businesses of their own. Das in German means "the" but in a different context, can mean "this." This fort, Das Fort, The Fort, The Fortress of Solitude, the trading post for pioneers founded by American Revolutionary War statesman Anthony Wayne in 1794. Like many words, das encompasses more of an idea than a single meaning. 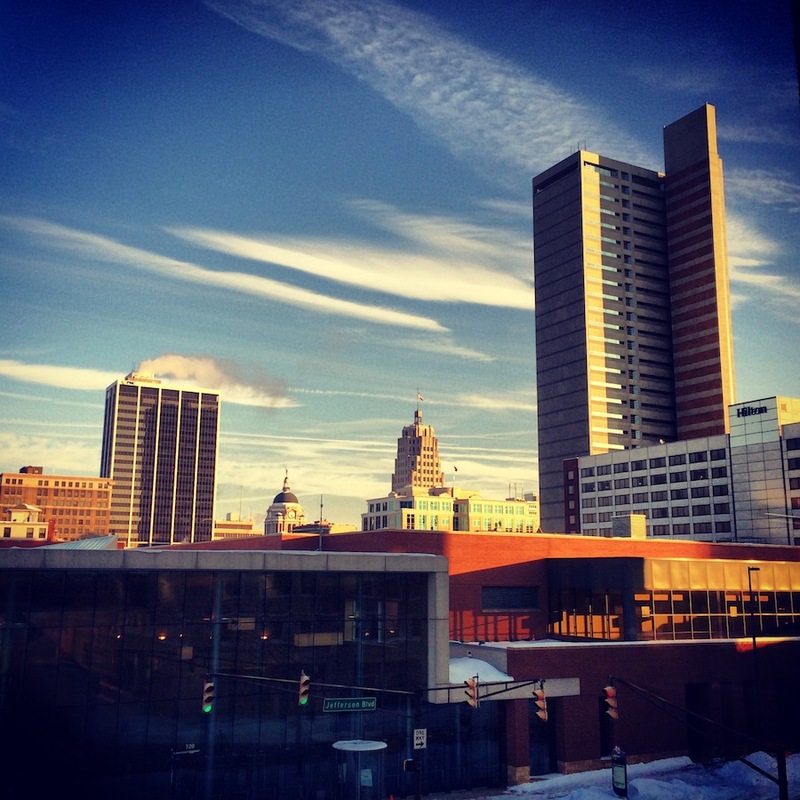 Fort Wayne is northeastern Indiana's cultural hub, the second largest city in Indiana, and the home of Fort Wayne's first small business blog, Das Fort. Intended to help promote the voice of the independent businessman, Das Fort is a place for locals to connect, to learn about the city in which they live, and also to get involved. Fort Wayners can see what's going on, learn about new ventures, and advertise for themselves. "I wanted to help small businesses and nonprofits; I thought Fort Wayne needed something to highlight the growing realm of arts, music, and entertainment on the unique scale that Fort Wayne is known for." The final resting place of American folklore hero Johnny Appleseed, Fort Wayne boasts fifteen museums and art galleries, two daily newspapers, a philharmonic orchestra, botanical conservatory, zoo, convention center, three minor league sports franchises and an NCAA Division I member school, and 86 public parks. While there are many large scale media corporations in the city, there is a market that needs addressing, the everyday man. Das Fort will soon be opening an online store, specifically aimed at small businesses who don't have the money to hire an agency, or even perhaps afford professional photography. "I want to provide a place for these small businesses to sell their wares, whatever and wherever they may be." The commonality: all are Fort Wayne locals. What does Fort Wayne do? Google this and you will get a wide smattering of answers. What does Fort Wayne produce? Wikipedia will tell you that it is a center for the defense contractor industry. Who is Fort Wayne? Das Fort is Fort Wayne working on new ventures, of the people, for the people, by the people. We're writing this story together, thanks for your part. Want to sell something in our online store? Have a story, start-up, or cause? Let us know. Watch the city through our eyes, follow us on Instagram: Das Fort!